Ink. It’s in my skin. When in London, I got a tattoo. I’ve been considering getting one for a long time. I booked my appointment in advance – at Frith Street Tattoo – and up until I actually walked into the tattoo shop, I felt more confident that I was going to balk at the last minute and cancel my appointment. More for fear of pain reasons than deciding against wanting something so permanent on me. I kept imagining the needle hitting my skin, and then I’d jerk away, the needle would skid across my skin, and I’d end up with some awful random line tattoo’d on me. A forever reminder of my cowardliness. But to my surprise, I actually went through with it. 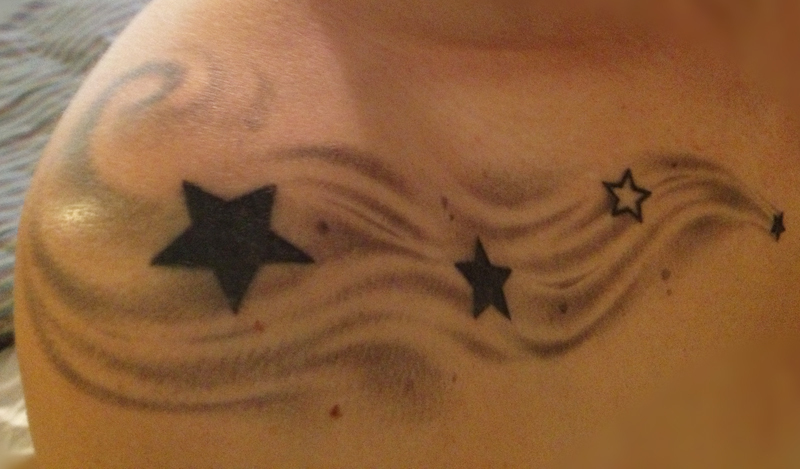 I had designed something in advance but went in to my appointment assuming it would not be exactly what I cooked up due to some of the stars being too small to tattoo (the ink would bleed, losing the shape). I was very quickly proven correct by my artist, Jordan, and we considered some alterations on the design. I feel much happier with what he came up with and am relieved I went in with an open mind as far as the artwork goes. The inevitable ‘did it hurt?‘ questions soon followed. Yes, but not as badly as I was anticipating (make no mistake, it still hurt). Shortly before I was set to get tattoo’d I realized there was almost no way it could be as painful as a migraine, I just kept telling myself that, and thankfully I was correct. The bit on the shoulder hurt and the vibrations also tickled somewhat, so that was an interesting sensation. The middle bit simply was painful. And the little bit on my sternum was excruciating. The healing process was annoying. It took longer than I wanted it to (of course), and I still don’t think it’s 100% done – in the 2 larger stars, the skin is still dry and peeling slightly. Before doing some research on what happens as the tattoo heals and going in and having the after-care explained to me, I always just figured that it would be agitated and red and possibly swollen for a few days, then be good to go. Yeah, no – that’s not how it works. Sadly. I’m happy to recommend both Frith Street Tattoo and my artist, Jordan. Coming from abroad I was unable to have an advance in-person consultation, but they were very accommodating in dealing with me, and I couldn’t have been more pleased with Jordan’s work. & – I’m back off to Varkala, India in just 9 days! Cannot wait! I’m very interested to see how Varkala is in peak season in comparison to how it was during low season in my last visit . So, so dead then. English Christmas II – Now with added rain!